In July 2012 Tulsa World announced The Flaming Lips would return to OKC’s annual Halloween parade – a rumor that was never true. The group had led the March of 1000 Flaming Skeletons from 2007-2010, leaving participants to wonder if their absence in 2011 was just a one year scheduling conflict or a departure from the tradition altogether. Fans were therefore understandably disappointed when Lips multi-instrumentalist Derek Brown alerted The Future Heart that the band was “definitely not doing the parade…The Tulsa World thing was in error” – though this news was overshadowed by something bigger and better in the works. This would be the last ever Zoo show under Innervisionsinc (following a heated battle for control). What better send-off could there be than a free show by hometown heroes The Flaming Lips? This was the ideal way for Innervisionsinc to thank all the fans who saw their concerts at the Zoo over the years – including Wayne Coyne who, among other shows, saw Phish there just a week before. What’s more, this would be a triumphant return to the venue for the Lips. Though they only played the Zoo once before, it was a legendary September 2006 show recorded and released as their live DVD/ MP3 download album UFOs at the Zoo. As the name suggests, this was the show that debuted a giant stage prop allowing the band to “land” on stage from a UFO – giving their own twist to the classic P-Funk and ELO entrance. On September 10th The Flaming Lips announced the show would be October 26th, with Stardeath and White Dwarfs and New Fumes – coinciding with the start of their King Crimson tribute tour and album release. Considering the 2006 UFO Zoo show’s status in Lips history, a return to the venue would be memorable under any circumstance. That it would also be a free concert and “costume party” as well as the last ever hosted by the longtime management suggested this would be a big deal – a Halloween Freak Out virtually guaranteed to become instantly legendary in the band’s lore. There were a few surprises at Freak Night, including Steven’s costume and the band’s jam on The Exorcist section of Mike Oldfield’s “Tubular Bells.” Though not planned, Wayne had a serious gash in his leg – perfect for gory banter. And then there was the talk of getting shots of blood from Starbucks. 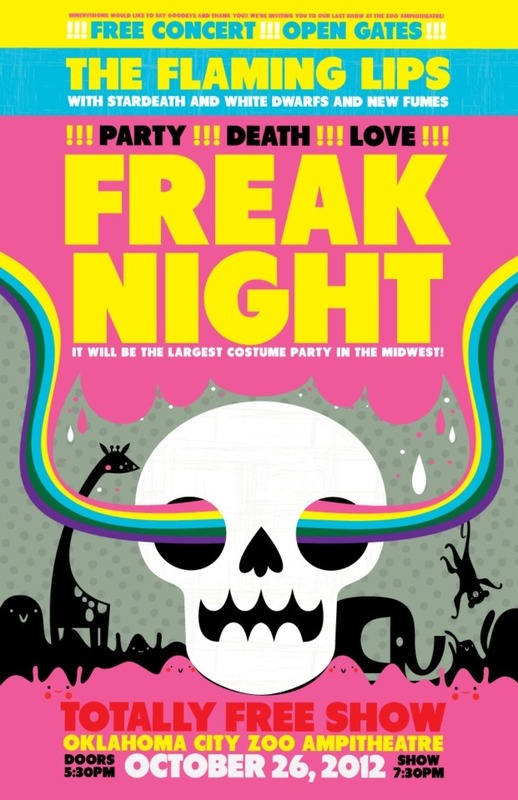 Freak Night’s theatrical premiere followed at a “special costume/dance party” that was part of the 2013 XPN Music Film Festival – attendees were encouraged to come in costumes. The second annual event produced by the Philadelphia Film Society was held April 12th-14th and also featuring Big Star – Nothing Can Hurt Me, Kathleen Hanna bio-doc The Punk Singer, and more. Below read the film tracklist and the official theatrical description followed by pictures from the night. I wish this was on DVD. I’m not crazy about the editing, but the performances are great. Thanks for sharing. Happy Halloween! Are they recording tonight’s Blood Bath? so you don’t possess to getting hired with your Mortal Kombat X – Game any possibility. app store that is clearly rising. Thx for share mate and good luck!